NUI is pleased to announce that in 2018, it will have granted awards to a value in excess of €1 million to NUI students and graduates. At the annual NUI Awards Ceremony held in the Round Room at the Mansion House on Tuesday 13 November 2018, the Chancellor of the University, Dr Maurice Manning presented awards to over 130 students and graduates. The awards honour and support scholars of distinction at every stage of their academic studies, from undergraduates to senior scholars already established in their fields of expertise. The core values of the National University are the nurturing of academic distinction and the provision of the highest quality services to its member institutions. NUI recently launched its new five-year Strategic Plan for the 2018-22 period. These awards are competed for annually by students and graduates of NUI constituent universities (i.e. UCD, UCC, NUI Galway and Maynooth University) and other NUI member institutions including RCSI, NCAD and St. Angela’s College, Sligo. 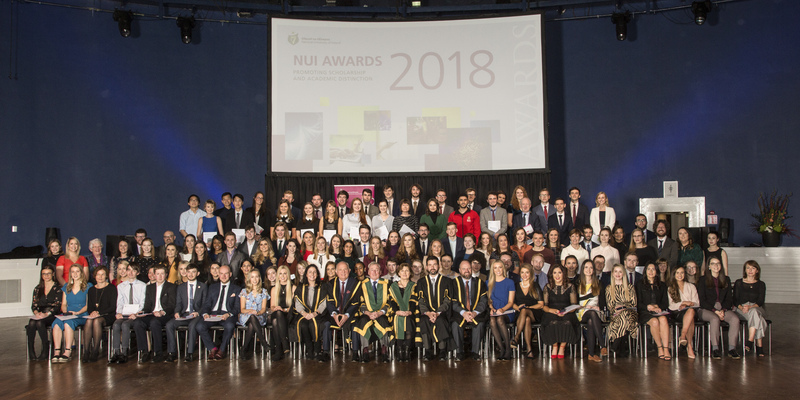 Students from the NUI overseas institutions, namely RCSI & UCD Malaysia Campus (RUMC, formerly known as Penang Medical College, Malaysia); Royal College of Surgeons in Ireland – Medical University Bahrain and Perdana University, Malaysia are also considered for the NUI Awards and are represented among the 2018 award winners. Guests attending the Ceremony are asked to be seated by 1.15pm and the Ceremony will commence at 1.30pm. Further information is avalible on the NUI Awards Page. Please see 2018 NUI Awards recipients for a full list of 2018 Award winners. Dr Kieran Fitzpatrick is an historian of science and medicine, interested in the moral, ethical and institutional contexts that shaped the practice of surgery in Britain and Ireland from the mid-19th through to the mid-20th centuries. In 2016, he completed his PhD in the history of medicine at St John’s College, Oxford, funded by the Wellcome Trust. Prior to this, he completed BA and MA degrees at UL and NUI Galway. Dr Fitzpatrick hopes to use the fellowship to further his academic career and to collaborate with members of the medical profession and the public at large on topics of mutual interest and benefit. Prior to moving to Palestine to work as a human rights advocate in 2006, Wesam Ahmad completed a Bachelor’s degree in Political Science and Sociology and a Juris Doctor of Law Degree from Louisiana State University in the USA. After over a decade of experience as a human rights advocate with the Palestinian human rights organization, Al-Haq, he went on to undertake an LLM and later a PhD at the Irish Centre for Human Rights at NUI Galway. Wesam hopes that the fellowship will help him both to pursue his PhD research at NUIG and to carry on the legacy of E J Phelan’s work in the area of business and human rights. Laura Cashman graduated with a BA in Irish and History and an MA in International Relations from University College Cork. She is currently undertaking an MPhil in Educational Research at the University of Cambridge where she will commence her PhD in Education in 2019. Her research will focus on the relationship between parental attitudes, perceptions and parental engagement in education in developing contexts. Daire Boyle graduated with a BSc in Computational Thinking and later an MA in Philosophy from Maynooth University. He has recently begun his PhD in Philosophy, examining the intersection of artificial intelligence and the philosophical discipline of phenomenology, in Maynooth University. Daire will visit KU Leuven in Belgium both to take classes and to conduct archival research. As part of his Travelling Studentship, he will also consult archives in Munich and Cologne. Keith Harrington graduated with a BA in History and English from Maynooth University where he recently commenced his PhD research which examines the causes of the conflict between Moldova and its separatist territory Transnistria between 1989 and 1992. The research focuses specifically on the linguistic dimension of the conflict. During his PhD, he will travel to a number of archives and libraries across both Moldova and Transnistria. Claire Raissian graduated with a BCL degree in Law from UCC in 2000. Following some time travelling, working in business and undertaking voluntary work, she returned to UCC to complete an LLM in Human Rights and Public Policy in 2017. She recently commenced her PhD at the Irish Centre for Human Rights, NUI Galway, looking at Reception Conditions for separated and unaccompanied children in Italy and Greece since 2015. As part of her Travelling Studentship, she will visit the Refugee Studies Centre in Oxford University as well as the jurisdictions of her research. Colm Ó Riada graduated from UCD with a BEng and an MEng in Chemical and Bioprocess Engineering. He will undertake his PhD at the University of Cambridge working with the Cambridge Graphene Centre, under the supervision of Prof A.C. Ferrari. He will work on developing solar grade graphene and related materials production for contact interfaces and the scaling up of production. He will be working towards creating graphene flakes with on demand thickness and lateral dimensions using microfuidisation. Following this his work will be on developing optimised electrode designs for printed Graphene Photoelectric modules. Conor Heffernan graduated from UCC in 2017 with a BSc in Mathematical Sciences and from the University of Cambridge in 2018 with an MASt in Pure Mathematics. He is undertaking his PhD within the Department of Applied Mathematics and Theoretical Physics at the University of Cambridge. Conor is working in the area of Fluid Dynamics where he will use a combination of mathematical analysis and computational methods to provide insight into fluid dynamical problems relevant in the environment and industry. James Barker is currently engaged in a PhD programme in organic Chemistry from UCD working on the synthesis and applications of axially chiral ligands in asymmetric catalysis. These ligands are used to alter the properties of metal atoms, which can be used to speed up bond formation in a selective way when making organic compounds. He graduated with a Bachelor’s degree in chemistry in UCD in 2017, which included a research project investigating the synthesis of analogues of natural products with anti-malarial properties. His project aims to improve the methodology available to synthetic chemists. As part of his Travelling Studentship, he will be visiting the University of Stockholm.